Dubrovnik is a very safe city to visit, very tolerant and open minded to visitor. As in every other European destination, you are encouraged to take security precautions to avoid any possible problems. With the start of the summer season and a large number of tourists visiting the city, the crime rate increases a bit. The worst thing that can happen to you is to be a victim of pickpocketing. Experiences from the past have shown that pick pocketers tend to be foreigners visiting the city. ATMs are available all over the city. There were cases of "skimmers", so if the ATM looks "fishy", go to the nearest bank. Always cover the numpad when entering the PIN. Dubrovnik is considered to be a safe city for everyone, so it is perfectly safe to walk the streets of all city areas during the day or night. Dubrovnik is quite covered with police patrols, so if necessary, the policeman is going to be easy to find. Most of the policeman speak English and during the summer season, you could find a policemen from your own country, thanks to the police exchange. Locations and contacts for other police departments are shown on map below. During the summer, whole Dalmatia region is prone to fires, so please be careful. Don't throw cigarette stubs out of the vehicle when travelling. Hiking and mountaineering is not a topic to be taken lightly in Croatia, especially in Dalmatia. Never mind if you are or you are not experienced hiker, hills and mountains in Dubrovnik region are not to be conquered in flip-flops and swimming shorts. Notify your family members where you are going and when you are planning to come back - stick to it! In Dubrovnik region, you could encounter wild or domestic animals on your hiking trip. Don't bother them and leave them alone. If you find yourself in potentially dangerous situation, beat your instincts, stay calm and slowly back away, avoiding eye contact. Most dangerous animal that you could encounter is a horned viper (Vipera ammodytes) - probably the most poisonous European snake. If encountered, you will easily recognise it by flat, pointy head with two horns on its stout. Horned viper is not aggressive and biting is its last resort of defence. Don't put yourself in situation to be bitten. It could happen that you step on it unwillingly, therefor wearing long sleeve trousers is a must when hiking. Other from horned viper, you could encounter a wolf, jackal, wild boar or mouflon. Dubrovnik region experienced a lot of war activities during the Homeland war, so there are remains of minefields in areas bordering Bosnia and Montenegro. Those areas are considered impassable and are marked with warning signs. If you see a minefield warning sign, do not approach it, go back following the path. Croatian Mountain Rescue Service is a volunteer, non-profit organisation, specialised in rescuing in mountains, caves and other unapproachable places. Its members do not charge their rescue missions - rescue missions are free. In case of emergency use the common emergency telephone number 112. Croatia belongs to Western European culture group (simmilar group: North American) with Christianity as main religion. Dubrovnik is very tolerable to other cultures and religions and you will not encounter any problems regarding your race, culture or religion. Outside of urban areas, the biggest problem you could encounter would be weird looks from individuals. Similar to previous chapter, Dubrovnik has high tolerance to LGBT oriented people and sometimes is very welcoming (LGBT cruises). Of course, stay alert and trust your instincts, there are always marginal groups of people looking for trouble. Cases of sexual harassment are usually low. 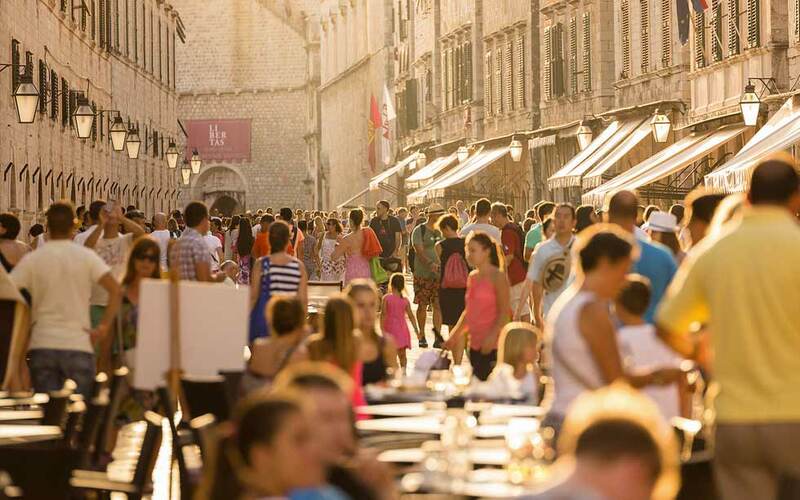 Dubrovnik region residents have Mediterranean mentality, which includes a lot of touching during conversation, which is not to be mixed with sexual harassment, but a show of affection or even friendship. Occasional wooing may happen on beaches by domestic single males (all ages!) popularly nicknamed "seagulls" (auth. galeb) - if you don't pay attention, they will go away and leave you alone. This form of wooing is considered to be a part of culture and completely harmless. With the large number of tourists coming to town, it is impossible to generalise if you are going to encounter spiked drinks or not. Usually there are no police reports of this kind of activity. Dubrovnik region is one of the major entry points for large quantities of drugs smuggled to European Union, so it is to expect occasional drug dealing in Dubrovnik. Be warned that the use and possession of any kind of drugs is a criminal felony in Croatia and penalties are severe. Prison sentences and/or large fines are a common measure.